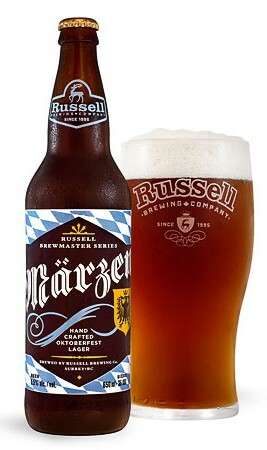 Description: Brewed in honor of Oktoberfest, this seasonal Fall release from Russel is fashioned using traditional German malts and Noble hops. The end result is a beer consistent with this darker, maltier variety of lager made especially to toast the Fall harvest. Tasting Notes: I am a sucker for Marzen and I’ve come to be a fan of what Russel has been doing of late. And I was an instant fan when I drank this one for the first time. In addition to its lovely dark color, rich malt, and subtle noble hop flavor, it has a smooth, refreshing taste that really won me over. Definitely a drinking experience I hope to repeat during the course of this season! This entry was posted in Uncategorized and tagged BC beers, German malts, marzen lager, noble hops, Oktoberfest lager, Russel Brewing, Russel Marzen by storiesbywilliams. Bookmark the permalink. They do a good job on this one, unless I can find an Ayinger this will be my token Oktoberfest beer. It is funny, traditionally in Oktoberfest they would finish drinking all the beer from the previous brewing season to leave room in the cellars for the new beers as it could only be brewed in the colder months – Sept to April (at least that’s what wikipedia says about Marzen!). They used to drink cellared almost expired beer during Oktoberfest and now we get treated with fresh stuff, I just wish more of it was as good as this one! It was quite tasty last year for sure.